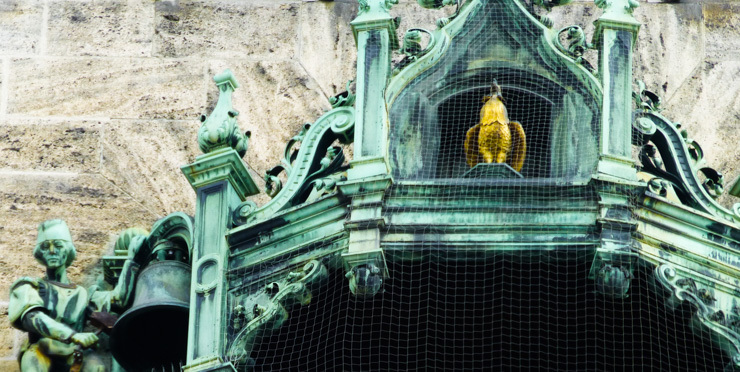 Munich’s glorified Cuckoo Clock, the Glockenspiel, isn’t all you’ll find in gorgeous Marienplatz square. Marienplatz is the main square in Munich. 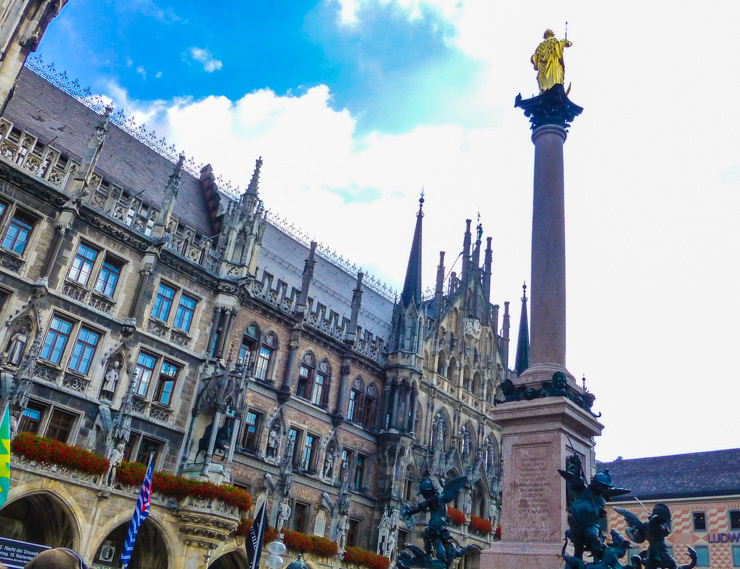 I immediately loved Marienplatz’s vibrant energy derived from the shopping and restaurants lining its perimeter, plus the historic buildings that stately stood in the square. 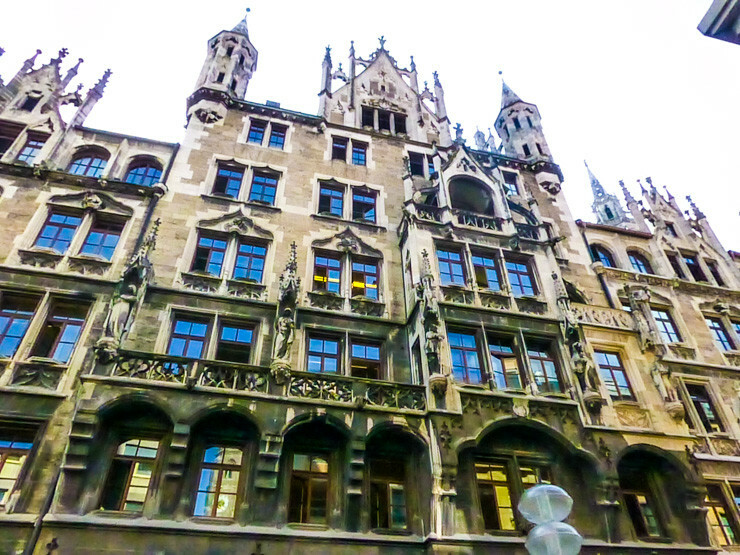 If short on time when visiting Munich, make time to see Marienplatz and focus on these four aspects of it: New Town Hall, Old Town Hall, the Column of St. Mary and – my favorite part – the Glockenspiel, a clock tower that houses motorized figurines and which I included a video of below. Glockenspiel in Marienplatz Square: Waiting to entertain the masses. The Glockenspiel was what I was most excited to see in Marienplatz. It just sounded so darn charming. Every day at 11 a.m., 12 p.m., and 5 p.m. (the 5 p.m. performance doesn’t occur from November through February) a performance of motorized figurines dance, joust, and twirl around the inside of the tower. The performance lasts 12 minutes and ends with the chirp of a cuckoo bird coming out above the display. I had to see it and arrived for the 12 p.m. performance. One nice thing about showing up to see the Glockenspiel performance if short on time in Munich is that it’s so high and Marienplatz is so wide that you don’t need to get there super early to get a decent spot to view the spectacle. I arrived about 20 minutes beforehand and a crowd hadn’t even started yet. This meant I got to be front and center, but off to the side a bit would have still had a decent view, too, so getting there 5-10 minutes early would likely have been fine. 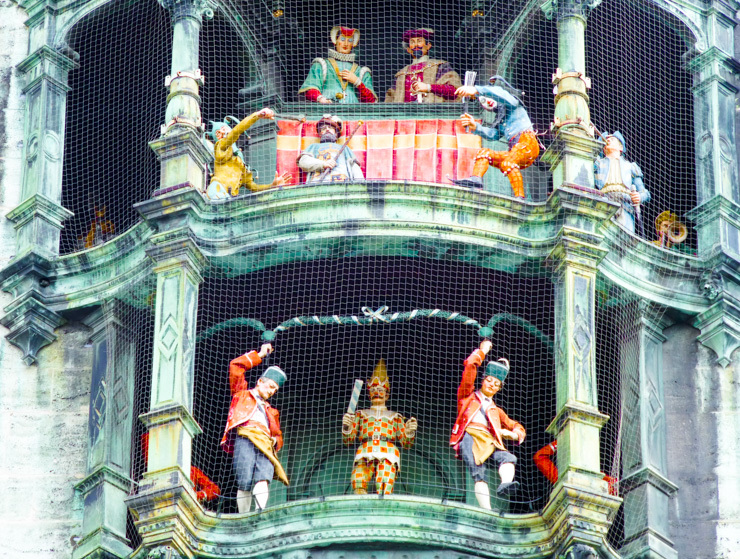 Right at 12 p.m. the Glockenspiel fun started and intricately painted and detailed figures began to circle around inside the tower. Twirling dancers while the King and Queen look on. The jousting figurines were my favorite. Here’s a video I took of the Glockenspiel, too, which showcases what the performance is like. 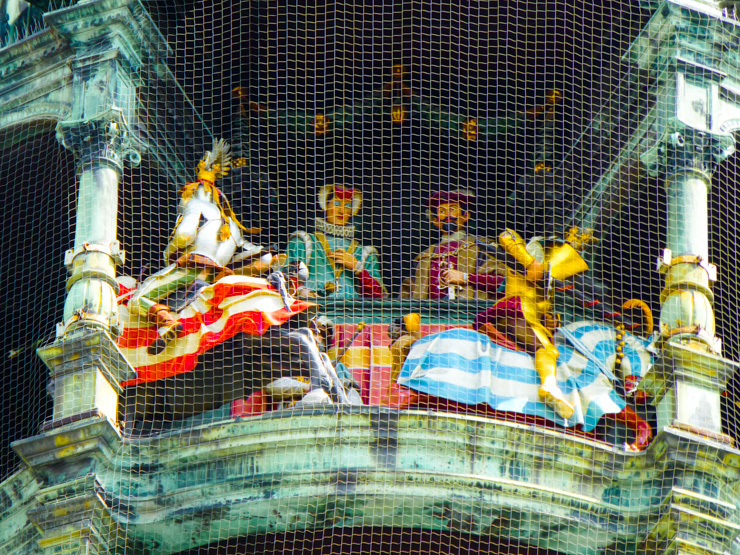 Don’t forget to wait at the end to see the bird — the Glockenspiel transforms into a very elaborate cuckoo clock at the end of the performance. The cuckoo bird comes out for its own little performance at the end. When we first arrived in Marienplatz, I thought New Town Hall must be Old Town Hall until I consulted my map, since it looks more elaborate and ancient. New Town Hall appears formidable and Gothic, and was built at the end of the 19th century. New Town Hall houses Munich’s city council, mayor’s office, and the headquarters of the city administration. 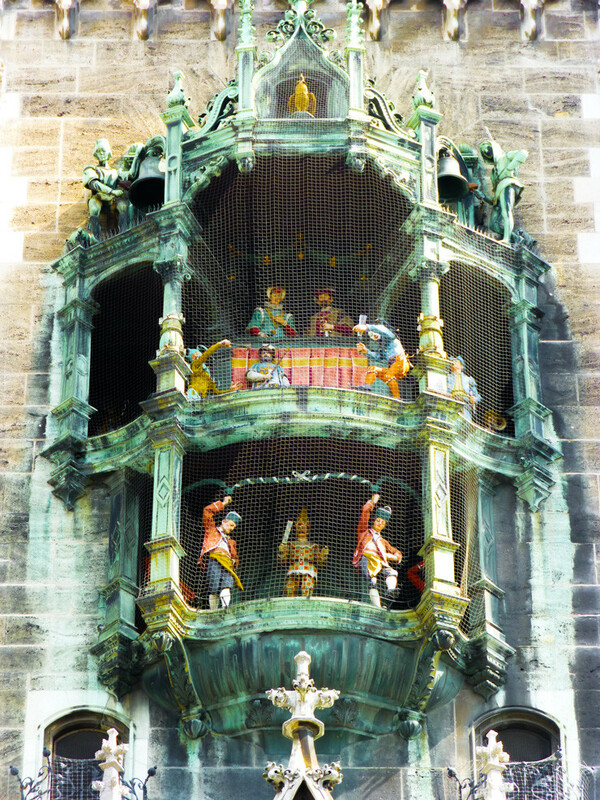 Its intricate tower is also home to the Glockenspiel and can be visited via an elevator for views of the city. 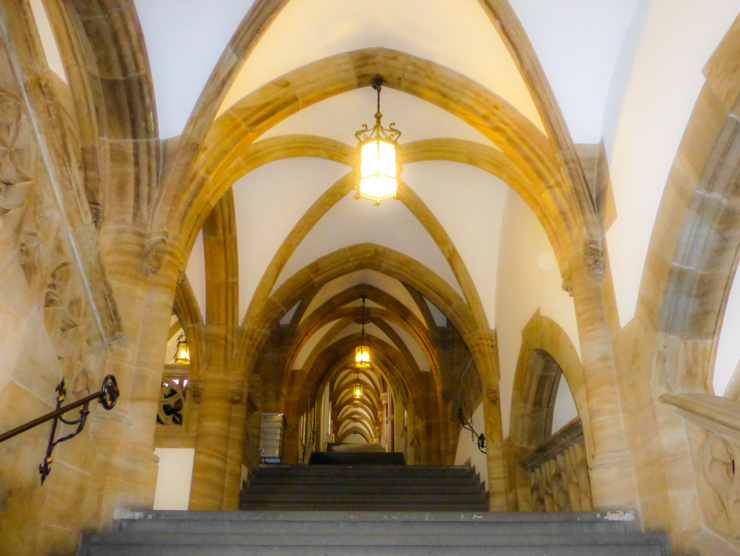 Touring the inside of Old Town Hall provides the opportunity to see some more of the Gothic revival architecture style, of which I was most intrigued by the cool geometrical staircase. Cool architecture on the stairs leading to (I’m assuming) offices and government meeting rooms. Built in the late 1400s, Old Town Hall stands tall in Marienplatz. Though the outside isn’t overly impressive compared to some of the buildings around it, Old Town Hall is still a pretty, white-washed building with its own little tower capped in orange. 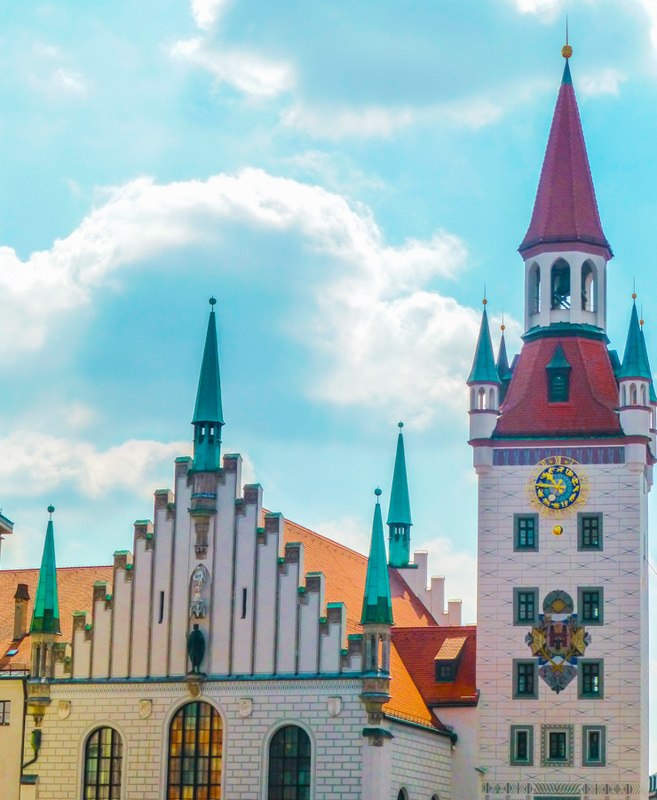 The architecture of Old Town Hall looks fitting for a Bavarian city. 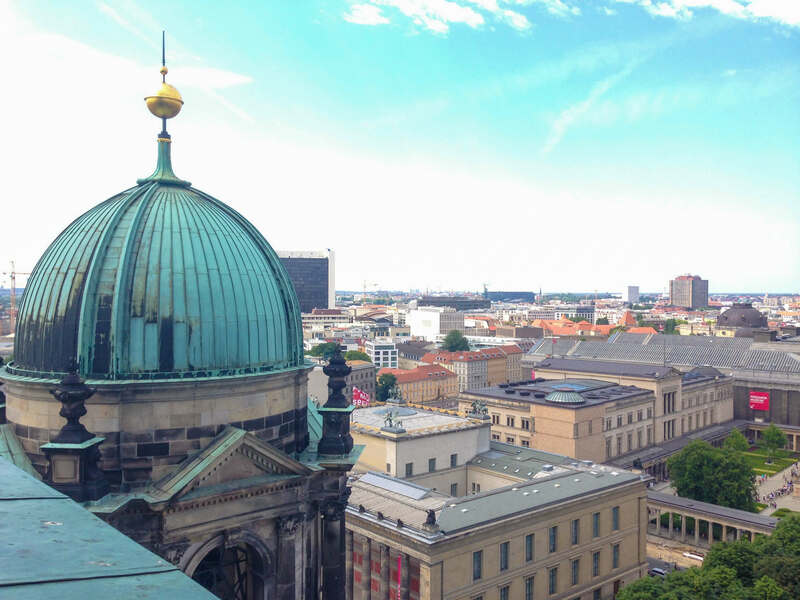 The 180-foot tower can also be visited for great views of the city of Munich. The tower also has historical importance as it was built prior to the rest of the town hall and was originally part of fortifications built to protect Munich. The Column of St. Mary in central Marienplatz. In the middle of Marienplatz square there is also a hard-to-miss statue constructed after the end of the Thirty Years’ War. The statue stretches vertically high into the air on a column and is flanked by four additional statues at the base. The elevated golden statue is the Virgin Mary, and thus this statue is often referred to as the Column of St. Mary, though its official name is Mariensäule. The four figures at the bottom surround the column on the corners and signify Munich overcoming heresy, hunger, pestilence, and war. Getting to Marienplatz is quite easy. 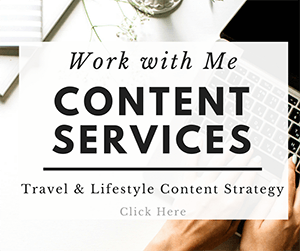 It’s centrally located in Munich’s city center and you can walk if you’re nearby and enjoy the city’s sights and sounds along the way or just hop on the metro and take it to the (easy to remember) Marienplatz stop, which most of the lines stop at.